Hello kids my name is Sue and I live in Lincoln which has a beautiful Cathedral which was once the tallest building in Europe and I sometimes play my trombone there.The trombone is really a giant trumpet with a slide. I was born in a pretty market town called Louth. It is a fun place for children with lots of hills and chalk streams that I used to fish for sticlkle backs. It is close to the seaside too. My first musical memory was hearing the local brass band playing at Christmas and was very excited when they invited me to play with them after only a few weeks of playing my new trombone. I had such fun at my primary school and I loved playing hop scotch and taking part in the school’s sports day. The egg and spoon race was my favourite. The challenge was to run as fast as possible without dropping the egg which was perched onto of a very small spoon. I used to listen to lots of music and one of my favourite records was the Planets by Holst. There are lots of exciting Brass sounds in his music. 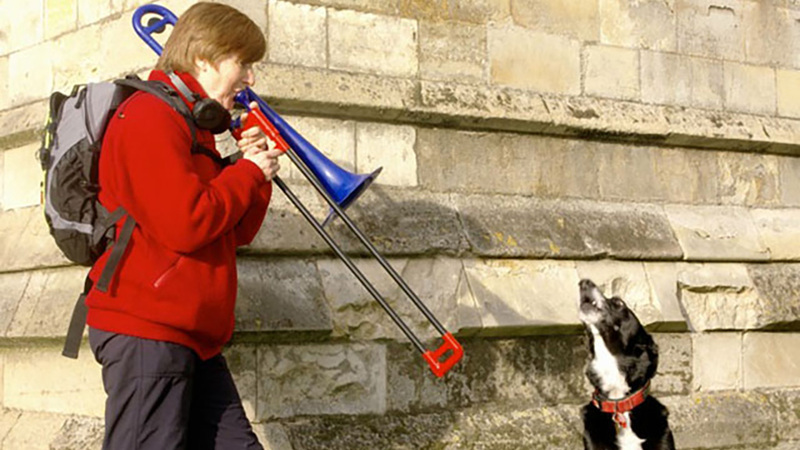 : I think it was because he was a trombonist too. I was also lucky to have the opportunity to hear music live. This was even more exciting as you could see all the musicians play and the sound was much better and louder than my record player. My teacher encouraged me to go to a brass summer school with the Philip Jones Brass Ensemble. Wow ! I just couldn’t believe how beautiful Brass Instruments could sound.It was then I decided that I would like to be a professional musician. What is wonderful about playing a brass instrument is can make so many different sounds.I think of these sounds like the colours in a painting.Very loud ( Red ) soft (pinks or pale blues) dark ( black or navey blue ) fast toungings ( dots in a painting ). When I practice a lot I can play really fast and that is lots and lots of fun. It really helps my playing and breathing if I keep really fit. I do this by walking in the hills and mountains with my dog Jack.You can see him with me in my picture. He loves singing a duet with me. I so hope you have as much fun as me learning a brass instrument. Music is a great way to tell a story and I hope that we can tell this story together. 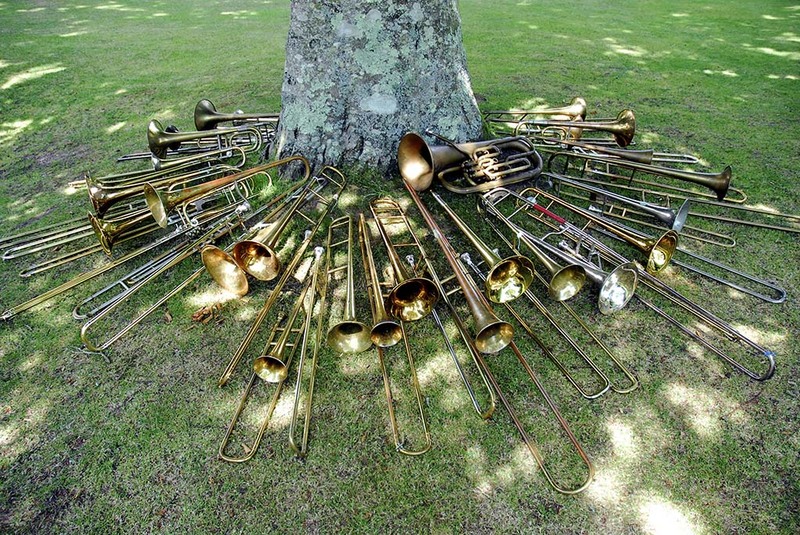 I have a huge cave full of different types of trombone and I will introduce them to you throughout this year.